Please note that this office works with local Vancouver-Hastings constituents and is not a part of the Ministry of Social Development and Poverty Reduction. You can reach the Minister's Office at 250-356-7750 and sdpr.minister@gov.bc.ca You are also encouraged to work with your MLA's office. Help communicating with BC government offices. You have a concern about police conduct, please direct them to the Office of the Police Complaints Commissioner. You are attempting to have a decision overturned by a provincial agency. Your concern is related to a greivance process independent of the Legislature, including the Ombudsperson, Police Complaints Commissioner, Representative for Child and Youth. You have missed the time limit for an appeal. Your concern if within federal or municipal jurisdiction. You have a disagreement with a neighour. If possible we will give you a referral to the person who can help! 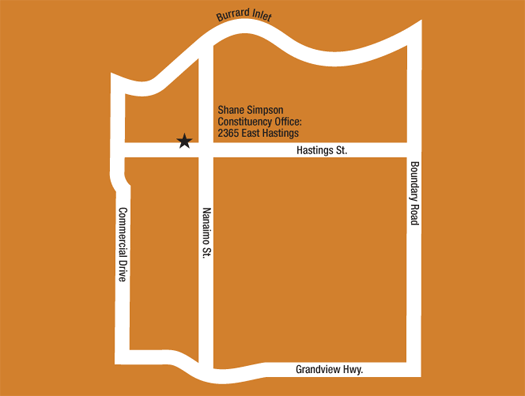 The Vancouver-Hastings community office is located at 2365 East Hastings Street near Nanaimo, right next door to the Royal Bank. Hours are 9 am to 4 pm, Monday through Friday, except for statutory holidays.